Cogeneration systems that improve overall energy utilization by simultaneously generating electricity and heat from a single fuel source have been in the news a lot recently. Distributed generation equipment, a type of cogeneration system, is driven by a gas or diesel engine. Advantages of the gas engine, which is widely used, include high thermal efficiency and secure fuel supply. However, the exhaust is likely to include pollutants such as nitrogen oxides (NOx) because of the high combustion temperature in such engines. To prevent air pollution, it is critical to control the exhaust gases. NOx removal equipment based on an ammonia injection process is commonly used to reduce NOx emissions. Optimum control of ammonia injection is achieved by NOx measurement, thereby reducing the cost of running such equipment. The highly sensitive and reliable SG750 stack gas analyzer is most suitable for the continuous measurement of NOx concentrations. 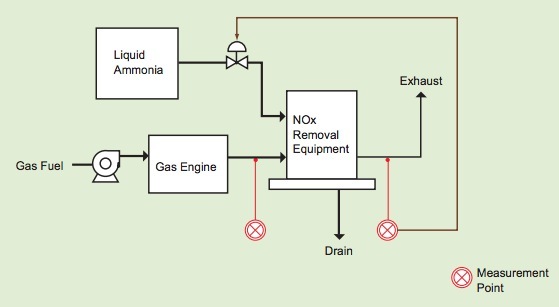 The running cost of a liquid ammonia process is high, necessitating NOx measurements before and after the operation of NOx removal equipment to control the amount of ammonia that is injected. the SG700 is installed near the sampling point. This may not allow the sample gas to cool sufficiently. the sampling tube is long. This may allow drained liquids to accumulate in the tube, causing sample components to dissolve and leading to measurement errors. the sampling tube is inclined at an angle of less than 15° to the horizontal. drain may form and stay in the sampling tube. Gas engine exhaust has a high moisture content. Care must be exercised not to allow drain pockets to form in the sampling tube. Care must also be taken to prevent excessive engine vibration. In Japan, NOx emission regulations apply to gas engines as well as gas turbines and diesel engines and NOx-O2 measurement of exhaust is obligatory. Since the gas fuel has little sulfur content, sulfur dioxide (SO2) is not present in the gas engine exhaust. By controlling the NOx concentration to a upper limit specified in the emission regulations, the amount of ammonia injected can be saved. In an exhaust system with a capacity of 1000 m3, approximately 2.5 kg of liquid ammonia (concentration: 30%) is required to reduce the NOx concentration in the exhaust gases by 100 ppm. The TDLS200 is designed to make fast, accurate measurements of gases including oxygen (O2), carbon monoxide (CO), methane (CH4), moisture (H2O), carbon dioxide (CO2), ammonia (NH3), and hydrogen chloride (HCl). It is ideally suited for environments involving changing pressure or temperature. Gas density analyzers and detectors provide continuous measurement of gas density as well as several other valuable parameters, including specific gravity and percent concentration.